The pressure on Minnesota’s rural health care system is unrelenting. National health care reform, shifting demographics and the overall desire to do something about costs have combined to change the look of rural care. So we’ve updated a Ground Level exploration published in 2011by adding a package of stories on where the state is on the hospital consolidation front. All the stories we generated last year are still here, a deep dive into rural health care in Minnesota. But we’ve added new material as large health care companies get larger and more communities wrestle with new trends. And, as always, the Ground Level blog maintains steady coverage as the issue unfolds. Communities that want or need to find a larger hospital partner can improve their bargaining efforts, say some who have been through it. a new round of consolidations that can add services to communities and let patients stay closer to home but that inevitably lead to the loss of local control. In an environment that increasingly rewards mergers, some hospitals and doctors are taking steps to maintain their independence. A fire last fall destroyed the small town's pharmacy. The trend toward big retailers and mail-order drugs is making it difficult to replace. Outstate communities are finding it increasingly difficult to land doctors who can do it all, like Heidi Korstad does in Bigfork. Can a small, independent hospital survive? The hospitals in Bigfork and Virginia in northern Minnesota offer a good contrast of how independent hospitals are facing the future. The push to increase health care efficiency by creating more electronic records is squeezing rural hospitals' already thin margins. A lack of physicians in rural Minnesota is leading to new ways to deliver health care, including use of midlevel practitioners and innovative ways to deliver care remotely. Iron Range residents dealing with mental health issues have a new tool, a mobile crisis team from the Wellstone Center for Crisis Stabilization. 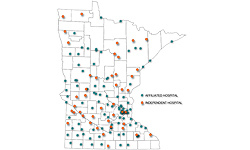 Affiliated and independent hospitals support the health infrastructure across Minnesota. 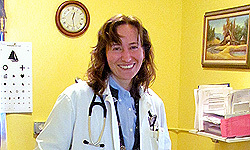 Dr. Susan Wasson in Osakis takes cash, checks but no insurance. She represents dissatisfaction with the health care system. How is the pressure on rural health care providers more intense than that on urban providers? 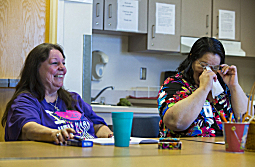 Health care in rural Minnesota is increasingly under stress. As MPR News has been reporting this week with its Ground Level project, outstate hospitals and clinics face myriad obstacles, including a critical shortage of physicians and nurses. Some spend years trying unsuccessfully to lure a doctor. In addition, they operate on ever-narrower margins. According to the Minnesota Hospital Association, one quarter of rural hospitals in the state operate in the red. This makes it difficult to keep up with a changing health care landscape, such as the push toward collaborative care and the mandate for electronic medical records. And yet, there are people all over the state--doctors, paramedics, teachers, administrators, tech experts--trying to deal with those challenges. Do you have a rural health care story? Help us cover the story of rural health care by sharing what you know. Click to show a list of affiliated hospitals. 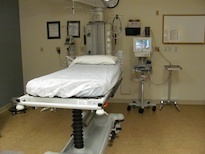 Click to show a list of independent hospitals. Ground Level reporter Jennifer Vogel talks about hospital consolidation on All Things Considered. People all over the state--doctors, paramedics, teachers, administrators, tech experts--trying to deal with those challenges. Here are just a handful of those people. Ground Level chose six towns to look at where change seems to be in the wind and will revisit them every once in a while to see how people are faring. Here is an introduction to each. The National Rural Health Association is a national membership organization with more than 20,000 members whose mission is to provide leadership on rural issues through advocacy, communications, education and research. The National Rural Health Resource Center is a nonprofit organization dedicated to sustaining and improving health care in rural communities. A product of the U.S. Department of Health and Human Services’ Rural Initiative, the Rural Assistance Center (RAC) was established in December 2002 as a rural health and human services "information portal." The County Health Rankings & Roadmaps program helps communities create solutions that make it easier for people to be healthy in their own communities, focusing on specific factors that we known affect health, such as education and income. Steps you and your community can take to influence health. Policies and programs, collected by the Robert Wood Johnson Foundation and the University of Wisconsin. Guide to creating a community health initiative. The Minnesota Hospital Quality Report is a web resource designed to support and help consumers, as well as providers, by making information available about the quality and safety of care in Minnesota hospitals. We asked nine doctors, nurses, paramedics and others around Minnesota to show us what it looks like where patient and provider meet. Three online discussions explored the personal experiences of medical staff and the public in the rural health system. Each of the discussions led with a question to start. Please share an anecdote or an incident that serves as an example of how a patient in need of help faced a barrier of distance or inability to pay. What happened? Question 2: Name one change? Is there one aspect of the medical system you would most like to see changed in order for patients to receive better care? Question 3: Better or worse? Is there something specific you have seen that explains why you think health care either will get better in rural Minnesota or will suffer from increasing obstacles? A conversation with a top official of one of Minnesota's fastest growing rural health networks. Our audience consists of Minnesotans interested in community life, particularly those who are taking an active part in it or helping others do the same. Ground Level is very much an experiment -- in finding ways to learn about and tell stories, in working with other organizations, in walking up to the line between providing insight and advocating specific actions. Our goal is to inform and give people the ability and incentive to engage with their community. We invite your feedback and your ideas, via the blog, twitter at @MPRGroundLevel, phone calls, emails, whatever. Join us.